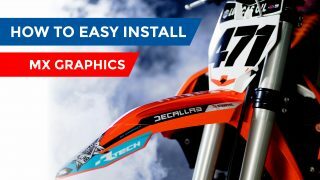 How to install your dirt bike graphics? Decallab provides a helpful installation guide, which includes some basic tools, tech tips and steps of installation. First use brake cleaner and paper towel to clean plastics matte. Then use alcohol based window cleaner and wipe all plastics very dry. Soap water or any other liquid will damage glue of vinyl. It’s very important to warm up your graphics after applying. Also it’s good to heat them up when applying tough curved plastics. Graphics templates may not always fit completely perfectly. That’s because there are different plastics producers all over the world. So use sharp paper knife to cut excess edges to make your graphics serve longer. It’s always good to leave your freshly wrapped bike for some good 24 hours before riding in track. Vinyl will take a curvature of plastics and glue will get harder. Do not rush and don’t skip any of those advice. For professionals application takes around 30- 45 minutes for all bike. For casual dirt bike rider it may take up to 2 hours to make all look mint. Watch the video and find out everything you will need for the installation, which not only will make your bike look fresh, but will also protect the plastics. We have built excellent co-operation with the reliable, globally operating courier companies TNT and UPS. These companies deliver the shipment to your doorstep anywhere in the world in 2–3 days, but in some cases, in up to 7 working days. Each shipment has its unique tracking number, which allows keeping track of the shipped graphics made by Decallab MX Graphics. Our company will do everything possible to reply to all clients in as short a time as possible and to meet the client’s needs as quickly as possible. We are the best, because we offer utmost individualised approach to each and every one of our customers. You can reach us by writing to our e-mail, in Skype, WhatsApp, Viber, FB, etc. In particularly urgent cases, when you need to get the product in a very short time, we offer the EXPRESS option, which includes immediate commencement of the design process and sending the confirmation e-mail within one working day, as well as express shipping services ensuring that the product is delivered in the shortest time possible. 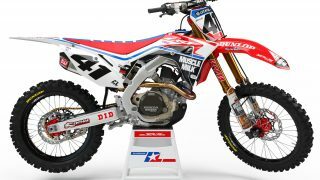 The United States of America is the birthplace of motocross — it has always been one step ahead of the rest of the world in motocross development. Therefore, the best materials for motocross purposes come from the United States of America. Decallab MX Graphics is a company that uses only the best materials made in the USA and offers top printing quality to achieve outstanding product properties — perfect material + perfect printing quality with intensive, bright and lush colours. 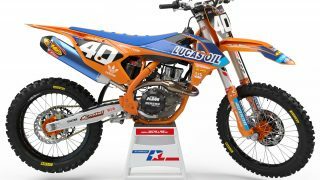 Decallab MX Graphics has templates of over 300 different models, and this number keeps increasing every day, as we co-operate with makers of graphics around the world. Graphics templates are professionally designed to fit flawlessly on any motorcycle or machinery unit. Graphics by Decallab MX Graphics are a perfect fit and fully cut without extra backing for paper edges to ensure utmost convenience for the client in applying the graphics. If our database does not contain the model you are looking for, it does not mean that we do not have the template for this motorcycle. Drop us an e-mail, and we are sure to find templates for your motorcycle.